Liferafts are our core business and we have proven experience in professional services and sports vessels. Due to our licenses from major brands, we cover widely and directly all the services. 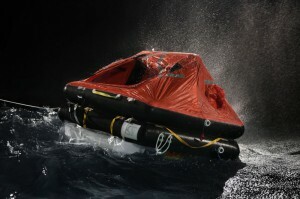 We perform mandatory liferaft´s servicing of any number of people under the rule of DGMM/IMO A761(18). The facilities available are valid for any type of raft and any configuration. SOLAS rafts include emergency package SOLAS A or SOLAS B in accordance with applicable Safety of Life at Sea, SOLAS 74 as amended III/21.1, III/31.1 and III/34: Emergency Equipment SOLAS A/B: 1knife, 1 buoyant bailer, 2 sponges, 1 sea-anchor, 2 buoyant paddles, 1 tin-opener, 1 waterproof first-aid, 1 whistle, 4 rocket parachute flares, 6 hand flares, 2 buoyant smoke signals, 1 waterproof electric torch, 1 spare set of batteries, 1spare bulb, an efficient radar reflector, 1 daylight signaling mirror, 1 copy of the life-saving signals, 1 set of fishing tackle, a food ration totaling not less than 10,000 kJ for each person the liferaft is permitted to accommodate, watertight receptacles containing a total or 1.5L of fresh water for each person, 1 rustproof graduated drinking vessel, 6 doses of anti-seasickness medicine and one seasickness bag for each person, instructions on how to survive, instructions for immediate action and thermal protective aids. For SOLAS B, fire emergency beacon devices are the half of the above mentioned. ISO Liferafts certified according to ISO 9650 for use aboard recreational boats up to 24 m. Avaliable enclosures: nylon bag, ABS and VTR. Emergency Equipment: 1 Repair Kit, 1 Flashlight torch and extra bulb and batteries, 1 Bailer, 1 Survival Manual, 2 Sponges, 1 Floating Knife, 1 air inflator, 3 Flares, 2 Parachute Rockets, 1 smoke signal, 1 waterproof first-aid, 6 anti-seasickness (person), 1 signal mirror, 1 whistle , 1 radar reflector, 2 paddles, 1 signal Table, 1 instruction manual and 1 thermal protective blanket (per person).